Use these pastor anniversary theme ideas to help plan your annual celebration program, banquet, or service. The anniversary of the date when your pastor first joined your church staff is an important time of year. As I said on the Pastors Anniversary page, this event can help a church honor the past, evaluate the present, and plan for the future. So whether you choose to make an announcement in the bulletin, plan an entire service, host a banquet, or even hold a week of festivities, a pastor anniversary theme can help tie everything together. There are an almost unlimited number of themes you can use. So I won't be covering them all here! But I'd like to hear about what you did at your church so that I can share your ideas with others. Use the form at the bottom of the page to submit your themes, stories, and ideas. Get all the help you need to plan and put on your pastor's anniversary service or event. This workbook contains a planning guide, bulletin cover, sermon, children's sermon, and much more. 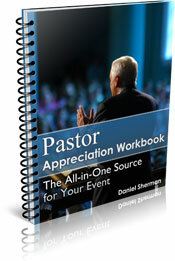 Get all the details about our Pastor Appreciation Workbook. This theme is based on Hebrews 13:7. That verse calls us to examine the lives of our spiritual leaders. Are they producing spiritual fruit? If so, we are to imitate them. 1 Thessalonians 2:4 reads, "For we speak as messengers who have been approved by God to be entrusted with the Good News..." (New Living Translation). Your pastor has been approved by God to be given the privilege and responsibility of teaching and protecting the gospel. A great way to brainstorm pastor anniversary theme ideas is to create a theme that's based on your ministry vision for the next year. Your pastor and church leaders have a clear picture of what they believe God wants your church to ultimately look like. But that portrait won't be painted in one year. So what color paint...what steps...will your church focus on this year as you create your masterpiece? Develop your pastor anniversary theme ideas based on your ministry emphasis for the next year. Here are a few random ideas to help spark your creativity. Will you be adding a second (or third) service next year? Will you be planting a daughter church? The thought of dividing the congregation for any reason can create discomfort. But if you emphasize that you must divide so that you can multiply, it may be easier for people to understand and accept. This theme helps people remember and honor their ministry past. It provides a great opportunity to review what God did in your church during the past year. While we keep an eye on the past, we are reaching toward the future. Your church ministry is built on the backs of sacrificial people...people who have been faithful in service over the years. To honor their ministry, your church must stretch for the future by implementing the ministry ideas of your leaders. This theme is really the same as the previous one. It just uses the metaphor of growth to make its point. You need deep roots to be able to grow healthy and plentiful branches and fruit. Will you be focusing on children's ministries next year? Are you planning to expand your Sunday School, add a mid-week children's program, or launch a kid's choir? Jesus said about children, "Unless you become as a little child, you cannot enter the Kingdom of God." You could incorporate the idea that Christ's Kingdom entrance is four feet high. To emphasize the point, build a special door into one of your auditorium entrances. Make the door about four feet tall. You could also make some signs like theme parks use to show how tall a person has to be in order to ride a particular ride. Only your sign would do the opposite. It would mark the four foot line and say that no one taller than this will enter the kingdom. You could use these props throughout the year to emphasize your theme. This is based on Philippians 1:3-6. In this passage the Apostle Paul thanks the people in the Philippian church for their active involvement in his life and his ministry. He uses a Greek word, koinonia, which has a range of meanings. But its essence is that of sharing, partnership, mutual involvement, fellowship.